Along with sudden explosion of new distilleries, there has been a proliferation of white dog whiskeys on the market in the last few years. White dog is unaged whiskey. Like vodka, it’s a popular first product for a new distillery as it can be immediately bottled and sold to start bringing in income. Rather than making us wait for their finished product, Woodinville Whiskey gives us the chance to share in the experience with their Age Your Owntm Whiskey Kit. The kit features a two liter aging barrel with stand, two 750ml bottles of 110 proof Headlong White Dog at 110 proof (55% ABV), a funnel to get everything inside, and two Glencairn tasting glasses to see how things are going. Prepping the barrel is easy. Fill it up with good clean water. Then let it sit somewhere that won’t be damaged by any leaks, until no leaks are evident. The point is to let the wood swell with to close any gaps, while not losing any precious liquor. There was almost no seepage from my barrel from the start, so after a day I drained the water. I tasted a little, which had just the faintest tinge of brown, and was amused to discover there was a slight hint of both oak and sweetness. In went the white dog, and the waiting began. A key decision in aging spirits is the location of the barrel. The ideal spot will change temperature. This helps the liquor expand into the wood and then contract. This is the whole purpose of barrel-aging. The liquor extracts various chemicals from the charred wood, changing the character of the final product. It also oxidizes with the air that manages to permeate the oak fibers. These processes change the original distillate. It’s up to you to decide when it has reached its prime. I was tempted to place the barrel on the plant shelf outside my window, but was warned against putting it anywhere it would get direct sunlight. I chose a shelf out of the sun but located where it would gain the most from the heat of the day and the cool of night. I managed to wait a whole week before my first taste of my experiment. It’s so much easier to take tastes from aging liquor than it is from fermenting beer. The high alcohol levels mean that sanitation is not a huge concern, and oxidation is considered a plus in this process. Simply remove the bung from the top of the barrel, place your glass under the spigot, and turn the spigot on, and you have a taste! After just one week, the whiskey was noticeably sweeter, with some very raw oak flavor, as well as a light straw color. I continued tasting about once a week. Some weeks it seemed like it was getting really great. And some weeks, it seemed really awful. 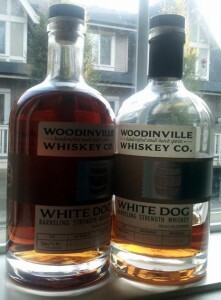 Talking to Orlin and Brett at Woodinville Whiskey reassured me. They joked about the occasional panicked call to their mentor, Dave Pickerell, former master distiller at Maker’s Mark, about how suddenly the whiskey was ruined. He’d reassure them that it was all part of the aging process. As different chemicals wax and wane through the process, the taste improves and worsens. The skill of the distiller of an aged product is finding that sweet spot that maximizes the benefits of wood aging while minimizing any negatives. Finally, after three months, I was satisfied. My whiskey had strong oaken notes, but a nice smooth finish. I choose to bottle at the same strength it went into the cask, rather than adding any water to reduce the proof. While I knew I’d taken a few ounces out of the barrel for tasting, I wasn’t prepared for just how much was lost. I had poured 1.5 liters of white dog, and bottled under 900 ml. I was very happy with what the angels left me. At bottling proof, it has a slightly stronger wood taste than I like in general when tasted straight. But pouring a jigger over a nice piece of ice brings it into a great balance. I especially like using my whiskey in old fashioned, especially with cinnamon syrup and chocolate bitters. Of course, I couldn’t leave that barrel empty! I’ll write about my additional experiences in barrel aging. As soon as I put this old fashioned down. Aging your own whiskey is a great way to appreciate what is really involved in making any aged product. I have a renewed appreciated for the art of the distiller. I can’t wait to see what Orlin and Brett have done on their own. Luckily, I won’t have to wait too long. On November 19, they are releasing their long awaited Bourbon, as well as an American whiskey. I can’t wait to compare it to my own whiskey. Provided I have any left. I have a lot of experience aging(multiple times) in my 2L barrel. Check out some of my stuff, if you haven’t: http://spiritedremix.blogspot.com/search/label/cask . It’s awesome that you’ve begun aging too, it’s super fun. BTW, I found that, for some reason, spiking your liquor mix with grain alcohol before you begin aging somehow appeases the angels and lessens their share. Best of luck with this, because the angel’s share loss can be VERY demoralizing, I’ve found. Thanks for the link and the suggestions, DJ! 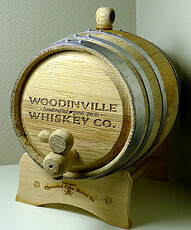 I found out that Woodinville Whiskey has the tools to re-char barrels, so I plan to get a lot of aging out this little baby barrel. I think every cocktail geek should try to age their own stuff (cocktail or spirit) at some point. It’s amazing to watch the changes happening. As you both mentioned above, you just gotta be ready for the angels share. Seems that angels get thirstier when visiting geeks’ homes than in distilleries.